The Hammock Hang Calculator lets you estimate how high to install anchor points for hanging your hammock indoors (or outdoors) and also estimates the horizontal and gravitational forces applied to your hammock system. The mobile app has more customization options. Love it! Even bought your book! Would love an Android app. Great news! The Android version is now available for both Google Play store and the Amazon app store. PS looking for the best anti mossie system in tropics ie what can I use to stop mossies coming up from underneath in warm environments? My daughter and I just traveled Japan for 7 weeks using this system… from Sierra Madre Research. http://www.smrgearme.com/buy-gear/ and it solves this problem of mosquito’s in spades! We hung both of our hammocks in this Nube’ (tarp system they have created) and loved everything about it! The link to the app in the Amazon app store is broken. A search in the Amazon app store did not find the app. Is the app not available in the Amazon store any more? Thanks for the update. I checked with the developer and apparently the app needs to be compatible with the Kindle in order to be listed on the Amazon App Store. The app was pulled because it isn’t compatible with Kindle. I have updated the link. I’m sorry about the confusion. Android users can access the app via Google. Hey, I downloaded the android version to my Samsung galaxy note8 and it keeps encountering an error. Any suggestions? I’ve heard this before. Some users restart or reload and it works. If that doesn’t help, send me an email and we will work with the developer. Seems there have been some issue’s with the android app. I noticed you stated it was being updated. Does it now work with the latest android phone software? It is specific hardware that has issues. Android issues are spotty and I can’t confirm with certainty which combination is having issues. I will ask the developer. We are working on a new version. New interface and features. The design has been submitted and it is in development now. Hej, there is an error in the JS code of this calculator. When I’m using the metric mode, none of the forces are displayed/updated. In the file hammock-hang-calculator.html in line 170 and line 171 the forces for tension and shear are expressed as variables, but they are implemented as function. The expression for the weight force in line 172 seems to be correct but isn’t executed because of the prior error. Otherwise neat and easy to understand calculator. My first hammock has been shipped yesterday and I’m excited to try it out. Thanks! I’ve fixed the code and it looks like it is working correctly now. No, the ridgeline is not the same as the size of the hammock. The ridgeline is going to be shorter than your hammock. My Hennessy is only 9.5 ft long when laid down flat, but you’d have to detach the ridgeline in order to pull it out flat. The ridgeline is the cord that runs inside the bug net on the top where the pocket organizer lives. The ridgeline keeps the hammock in a curved shape. Leave a number, even if zero (0) so the app doesn’t kick back a non-number error (NaN). So what should the input be for a HH EXPED ASYM? pretty excited to get a good hang in my HH. I believe that is a 10 ft long. Love the calculator. Hope you make a android version. Android people hammock too. I know, I know 🙂 I’m looking for a developer. It’s not for lack of desire, but lack of funding. I think what makes this confusing is the physics. There are a few forces at work here. First is the weight, or the vertical force. If you weigh 100 units, than each side would share 50 units of vertical force. If the ropes hung down at 90-degrees (straight down), the only force would be vertical. But there is also horizontal force, based on the angle of the hang. The calculator adds the horizontal force based on the angle, so each side will add up to more than half the weight that is in the hammock. Half the occupant weight + horizontal force = total force on each side. 50 (50% of occupant weight) + 50 (horz. force) = 100 units of force applied to _each_ side. When you decrease the degree of the hang, you increase the horizontal force. Each side is still sharing an equal amount of vertical force, but they will _increase_ the horizontal force, meaning each side could bear _more_ force than what is being held in the hammock. This throws some folks off because it doesn’t seem to make sense that if I weigh 100 units, each side of the hammock suspension is also bearing 100 units. If you think in terms of “force” instead of “weight” it makes more sense (at least it does to me). It’s not that you magically star weighing _twice_ as much, but the forces are increasing. Here’s where I’m confused… if the shear force is 300 units do I need two hooks that support 150 units each or two hooks that support 300 units each. I would hate for the hooks to fail and drop me 18 inches…plus I tend to wiggle/swing in my hammock. Falling is so not on my list of things to do. Especially unexpectedly while asleep. OW! Was much easier in Mexico where the hooks are part of the cement wall and the hooks failing seems rather impossible! Ha! I’m not good at physics either; I just spent a night in a Holiday Inn Express 😉 Seriously, I’ve had some help understanding this myself and I often have to refer to my notes to make sure I have it right. What you are looking for in gear is “safe working load.” When hammocks are rated, for example, they take the breaking strength and then reduce that by a factor to get the safe working load. For example, a hammock with a weight limit of 400 lbs will likely have a breaking strength of 1,600 lbs. This is important because they consider the dynamic aspect of hammocks, just like climbing gear: as you move about in a hammock, you exert different amounts of force. This buffer gives a safe margin of error. You typically want a safe working load of 4:1 or 5:1 or some go as far as 10:1. A 10:1 ratio is more common with more critical activities such as mountain climbing or hauling freight. A hammock with a 4:1 safe working load factor that is rated at 250 lbs has a breaking strength of 1,000 lbs. This is sufficient for the type of activity in a hammock. If the force is 300 lbs, you’ll want a minimum safe working load of 4:1, so you’ll want each component of your hammock system (hooks, ropes, hammock, etc.) to be safety rated above 300 lbs. It’s important to understand the difference between safe working load and breaking strength. Some suspension items, like webbing or rope, is often rated at breaking strength, so you’ll need to calculate and reduce them down to make sure they meet or exceed 300 lbs. If the hardware or soft good you purchase is “safety rated” at 300 lbs, than you should be fine. Manufacturers are required to list the ratio they used on the gear. For inside my home, I purchased some 3/8 in steel eye bolts. They had a safety rating of 325 lbs and they’ve been working great! That helps a lot. I’m dealing with an older Mayan string hammock, which I love and have no concerns over a sudden failure there. My only concern was with the bolts going into the stud. I could not imagine that I could unexpectedly break a steel hook (would expect signs of stress to show before failure) BUT when it comes to suspending myself from the wall, I’d prefer not to be stupid. Sorry to be a pain, but your explanation of the division of the forces on the suspension lines I don’t quite get. If you have a total of 250 pounds (occupant plus the hammock, suspension and any additional gear), that is the total gravitational force acting on all points in the system. The only thing you can change is how this force is distributed (ie vertical or horizontal) . The only way you can add more overall force is if there is a ridgeline between the two hang points and this is pulled tight BEFORE adding the occupant weight. This additional force would then need to be added to the suspension line forces, but only if the ridgeline is attached on the lines below the hang points. If you are building in a safety factor by ensuring that each point will carry the total weight then I can fully appreciate that, but that should be stated in the graphic somewhere. Otherwise it is a great calculator and very helpful. Cheers. Steve, you have a great question and it is one often brought up, so it isn’t a pain. I had the same questions before I understood how it works. This is a question of physics related to practical trigonomic forces. The first thing to understand is that there is more than gravitational forces at play here. If it were just gravity, we wouldn’t need the calculator. The answer would be as simple as dividing the gravitational force in half (e.g., the weight in the hammock). When you push or pull against a wall, you exert force against that wall. The wall also exerts force in the opposite direction in equal amounts. When your pull force exceeds the wall’s force (e.g., its rated strength), you can pull the wall down. With trigonometry in play, you have to add up the total forces in play to get the final number. Gravity pulls, creating a downward force. The hammock also exerts a horizontal force/pull against the anchor point. Depending on the angle of the suspension, this horizontal force can be minimal (e.g., if the ropes are hanging straight downward), or the horizontal force could theoretically be infinite if the suspension was perfectly horizontal. Thankfully, it is impossible to achieve a perfectly horizontal force, for lots of reasons. To find out the total force applied to the hammock we add up all the known forces. Yes, you do divide the gravitational downward force, so a 100 lbs weight becomes 50 lbs of downward force on each side. You also take the horizontal force and divide that in half. However, the horizontal force is variable, depending on the takeoff angle of the suspension. If it is too tight, the forces are stronger. This is why the “magic” 30-degree angle is recommended beyond making it easier to sleep on the diagonal. At 30-degrees, the horizontal force is roughly the same force as the downward force. This is why a 100 lbs occupant has 100 lbs of force on both sides of the hammock. We add the 50 lbs of downward force and the 50 lbs of horizontal force to each side. If the angle were different, the horizontal force would change, but the downward force would stay the same. It seems almost counterintuitive that more force is being applied than there is weight in a hammock, as if you magically gain weight. You need to think in terms of forces not weight and it helps clarify the problem. For example, a small pebble that weighs a few grams can exert more force than its weight if it is swung in a circle, say, in a sling. This centrifugal action applies more force than just the weight of the stone. If we could put a scale under the rock while it were spinning in a circle it would register as being “heavier” than if it were just hanging straight down. The calculator is just for estimating, as I cannot predict all the forces at play, just those I can easily calculate for known values. For example, just sitting in a hammock adds some dynamic forces beyond a static weight. Speed and velocity of the sitting action can add more force than just the weight. Swinging in the hammock will add more force. When you consider all the forces that are or could be at play, you’ll see that this isn’t such a simple calculation at all, although the calculator itself is only doing the most rudimentary calculation. Understanding these forces helps clarify to me why some hammocks rip apart when the occupant claims to weigh less than the hammock is rated for. This is also why folks recommend a safe working load limit by reducing the breaking strength by a factor of 5 or more to account for the unpredictable dynamic forces at play. The only force exerted is gravitation. The rest is a matter of equilibrium of forces and moments. Ropes and webbing aren’t very good in transferring bending moments. If you try to, it will curve up into a bend. Which means the only force it can transfer is tension. Now the hammock has suspension cords on two sides and Newton’s First Law of Motions tells us that the sum of the horizontal components of all forces (the cord tension in the two suspension cords) has to add up to zero, otherwise the hammock will start moving in the horizontal plane. And finally it tells us that the sum of moments about the center of mass of the hammock and its inhabitant(s) have to add up to zero, otherwise the hammock and its inhabitant(s) will start spinning. Which means the gravitational force will be divided 50/50 over the two suspension cords, when the center of mass of the hammock plus its inhabitant(s) is exactly in the middle between the two suspension points. (the tree or whatever) If the center of mass is shifted towards one of the suspension points, the *vertical component* of the suspension cord tension on the side of this suspension point increases proportionally, reaching 100% of the gravitational force when the entire mass is suspended straight below one suspension point. As the horizontal component in one suspension cord has to remain the same as in the other (or the hammock will start moving) this also means the angle between the suspension cords and the horizontal plane will change. So from the equilibrium of moments and the equilibrium of vertical forces one can calculate the vertical component of the suspension force (in the suspension cord). The cord tension can then be found by dividing the vertical component by the sine of the angle between suspension cord and the horizontal plane. Finally the horizontal component can be obtained through multiplying the cord tension with the cosine of the angle, or by means of Pythagoras’ theorem. Each suspension line must produce an upward (vertical) force of half the hammock’s weight in order to hold it up. If the hammock was being hung vertically by two ropes pointing straight up, the tension in each rope would be half the weight. As you move the two ropes apart, you’d notice that you weren’t just pulling upwards anymore to hold the hammock, but that you are also pulling horizontally. The farther apart the two ropes get, the more horizonal force is required to produce that necessary upward force to hold up the hammock (half the weight). Thus, you’ll have to add more tension to the rope to hold the same weight as the ropes move apart and the angle decreases. In Newtonian physics, you’d draw two perpendicular force vectors, Fv and Fh, which form the legs of a right triangle, and the tension would be the sum of those forces, the hypotenuse of the triangle, along the suspension line of the hammock. We know Fv, it’s half the weight of the hammock, but we still need to know Fh. Now plug in α = 30º . Remember, tan(30) = sqrt(3)/3. T = sqrt(W^2/4 + W^2/(4 * (3 / 9))) = Sqrt(W^2/4 + 9W^2/12) = Sqrt(3W^2/12 + 9W^2/12) = Sqrt (12W^2/12) = sqrt(W^2) = W !!! If you remember common right triangles, you’d know that for a 30º triangle, the hypotenuse is twice the length of the short leg. So in this case, where the short vertical leg is Fv = half the weight, then the hypotenuse, T, is twice that, the full weight. This is awesome! It’s going to take me a moment to decipher some of this (I won’t claim at being a math expert). I have a question on the suspension cord tension. If there are two hang points, how can each one be carrying the full weight? Or is that calculation the total between the two suspension lines? Same with the inward pull. Hi – and wow……….all I want to do is sling a hammock in a shady spot ! Problem as I see it is that without an even length of rope on either end then everything changes and the calculations totally did my head in !! Does the calculator only work if the hammock is slung exactly in the middle of the supports ? Do I need to have the longer rope strung higher in the tree to still achieve a comfortable level ? I also plan this to be a comfortable 2 person hammock for lounging ( maybe the magic 30 degrees changes ?? ) Any suggestions as to a good quality, affordable and durable hammock that fits the bill here ? Thanks for doing my head in – as a previous post said, ” falling is not on my to do list !! “. Cheers, Todd. Todd, not to worry! This calculator is more for estimating, as I mentioned in another reply, there are a lot of dynamic forces I cannot calculate for. This tool is best used as a way to figure out approximately how high to attach your hammock. For example, if you know how long your hammock is and how far apart the anchors are (e.g., inside a room) you can punch in the numbers and get the height where to set the hooks (or tree straps, etc). The force calculation may change if the hammock is not level and even, but I suspect that it’s not far off. I think more depends on how the weight is distributed in the hammock. As for a good two person hammock, I suspect you are looking for something to hang in the backyard? For casual lounging any hammock labeled “double” will do, but they won’t be cozy for sleeping long term unless you both like conjoined sleeping. 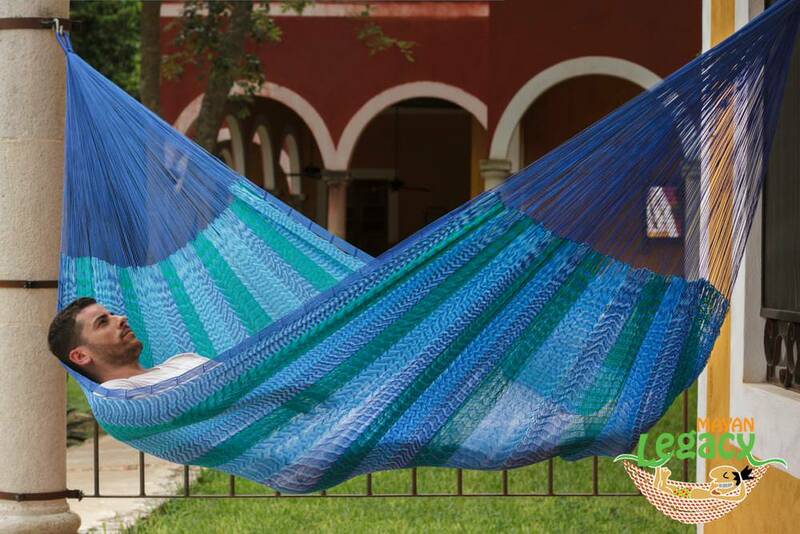 A great hammock for lounging is the queen or ‘matrimonial’ Mayan hammock. Bar none the most comfortable hammock. Authentic Mayan hammocks sold from Hammock Rada for example are amazing. Too heavy for backpacking, but backyard hangs or car camping are perfect. For camping, I recommend getting separate hammocks. Hi, Thanks for a fantastic resource. Could you clarify one thing for me please? Is the “suspension length” number for each side, or is it a total length for both sides of the suspension? Deon, the length is for each side. It’s amazing what we can do with math. I wondered growing up how these things might be useful. Its a good tool thanks. Possibly a dumb question. Can I use this even if I don’t use a ridgeline? I am planning an inside hang and don’t want a ridgeline in the way. Yes! The ridge line is not a necessity. Use as normal and remove the ridge line length. Hi! What about a hammock with spreader bars ? Very good question. If you’re looking for help with rope hammocks, in afraid I cannot help you. 🙂 I’m not a fan of these tippy contraptions and would prefer if the world was rid of them. 😉 Seriously though, I’m not planning to support those hammocks but the general rules apply. I do need to update the calculator for bridge style hammocks that have spreader bars. It gets tricky, though, because if the three commercially available bridge hammocks, they have different requirements. for a bridge hammock, wouldn’t you just need to know the vertical distance (ridgeline height) between the center of the hammock and the ridgeline? then just calculate the ridgeline to be sit height + ridgeline height off the ground? Ah! A bridge hammock. The calculator is it tuned (yet) for bridge hammocks. In my testing you can use the calculator but the hang point needs to lower about 12 to 18 inches lower than what is stated. Since we like to hang the foot end a little higher than the head end….do you have a suggestion for the difference? This is an interesting request that I’m considering when updating the app. It’s really a subjective measure based on your own preferences. From the baseline, you could drop the head end lower, or raise the foot end higher as both achieve the same result. Anything from six inches to a foot is about all that’s necessary. I’m trying to hang two hammocks in one room, to resemble a bunk bed, a bunk hammock, I guess, but would like to divide the force of each hammock between two studs, just to be on the safe side regarding the structure of the building. I was thinking on using a 2 x 4 long enough to reach two studs (between 16 in and 24 in) placing it horizontally. my problem comes when deciding on the kind of screw eye bolt as since i’m talking about a 2 x 4, the eye bolt would have to be 2 inches long, and those are not strong enough to hold the desired weight. Then I thought of the possibility of using two eye bolts, placing one safety hook on each eye bolt and a chain hooked from each safety hook, to finally hang an extra safety hook in the middle of chain to finally hang the hammock. I’m not that heavy, just want it to be sturdy, and again be cautious with the building structure. Hope I’m making sense… what does the hammock experts think? would it divide all the weight between the two studs? would it be functional? In one room, I have three eye bolts drilled into one stud. The studs I picked are on key frames so there are multiple studs together. I’m not sure if that really matters, but it works. Hi Derek. This is a great site. I have a question about the calculator. It seems like hammock length doesn’t affect strap height on the calculator. Is that correct? It seems like as you change hammock length, either the strap height or the seat height would have to change with it. I have a WBBB that I routinely hang in my backyard. I think it has the stock ridgeline, which I think is 101″. I have recently hung my Yukon hammock, which only has a 93″ ridgeline. In order to get the same sag and sit height, it feels like I need to move my tree straps up higher. When I sketch it out on a piece of paper, it seems to make sense. If your hammock is shorter, your suspension has to go farther down to connect. This would lower seat height quite a bit. If you wanted to stay out of the dirt, you would need to raise your straps. I posted this question on Hammock Forums and the people who responded seemed to agree that you need to raise the suspension with a shorter hammock. Have you considered this in the calculator, or am I off somehow? Thanks. Mike, given that your anchors do not change but you are changing the hammock, you should see a change in the hang point depending on what changes on the hammock. In my testing, I’ve found that longer, wider hammocks benefit from a deeper sag (about 45° or so) thus giving you a more dramatic diagonal. Shorter and narrower hammocks benefit from shallower sags, or in other words, a tighter pitch (about 20° or so). Most 10×5 foot hammocks, common in camping, work with a 30° hang angle typically. Given the same sit height for these different hammocks, you should have different hang points because the take off angle is different for each. The suspension length will also be different. I’ll look at the calculator and see if this is working correctly. Thanks for your answer, Derek. It makes sense. I never thought about shorter hammocks benefiting from a slightly tighter hang. I currently can’t hang my shorter hammock much tighter, because I think I would snap my ridgeline. I think I will experiment with lengthening my ridgeline a little, which should allow me to hang my shorter hammock at a little tighter (shallower) angle. This would also allow me to lower the straps a little. As always, you have given me something to think about. Thanks again. I’d be really cool if this were slightly more adjustable… specifically, if the “hang point” height could be fixed to allow for an adjustment in the “distance between anchors”. For example, when hanging from underneath a porch or covered area, where none of the vertical supports are in a good place to attach the suspension, but there are horizontal support beams than run all along the edges and give almost infinite adjustability to the “distance between anchors”. It sounds like what you are asking is already in the app, you just have to manipulate it differently. Currently, the hang point is not editable because it is a result of the hang angle you want, the sit height, and the distance between anchors. In your example, if you need a shorter hang height but still have a wide hang distance, you will need to use a smaller hang angle. It is not clear to me, at least in the calculations for the height of hanging a hammock, if your measurements are from: the solid part of the hammock; the bar from which al the strings attach to the hammock,; or from the ring-shaped terminal points, or from some other point on the hammock. You need to measure the overall length of the hammock, including the clew and steel ring. If your hammock has spreader bars, that complicates things slightly since the spreader bars raise the hammock up. You’ll have to experiment, but in my experience you will need to lower the hang point about 12 inches for spreader bar hammocks than what the calculator lists. Can’t seem to get a hang height no matter what values I put in. No fields have been left blank. Even the “reset” values give me a NaN ft value. Any help? Which calculator are you using? The online version or one of the mobile apps? Send me a PM to theultimatehang@gmail.com and we will try to debug. This is a great aid and it would be even better if we could fix the vertical height so the parameter we can change is the suspension distance from a fixed height to hammock ends. When hanging at home, sometimes the height of supports is fixed. And sometimes, if you are not 6.5 ft tall, your reach is limited beyond 6ft. . Also, although it is easy enough to bring out the calculator to get 83% of physical hammock length for a ridge line length, it would be nice to be able to specify physical length with a check box to use 83% – or just list on the page, 83% of 8ft, 9ft, 10ft, 11ft, 12ft for reference. Great thoughts. Let me see what I can do. Derek, loved your book–was reading it while I was enjoying my first hammock camping experience! Maybe enjoyed is too strong a word, since we hit record low temps (26F) for that weekend. Regardless, I’m still hanging when I get a chance. Looking at your calculator, it looks like whatever cord is used for the Ridgeline will have to be strong enough to withstand 2x the Shear Force. Am I reading that correctly? I’ve had the app installed on my iPhone for a while, but only recently took a look at it again. Since you can enter both a ridgeline and a hammock length, does the app account for the hammock sag when calculating Hang Point? In other words, will it take the sitting height, add the distance between the hammock and ridgeline, then add the vertical distance due to the suspension (based on calculations of tree distance, ridgeline length, hang angle)? Thanks! It should. Another user posted a similar question so l am going to look into it. Thanks. I’m using Lash-it for the ridgeline, and that’s listed with a 500lb strength. I just want to make sure I don’t exceed that. To keep my bug netting from dragging in the dirt, I can either stretch up higher on the trees or shallow the suspension angle (which puts more stress on the ridgeline). I use Lash-it myself, and even smaller line. I don’t believe it had the same tensile forces, but I’ll check in to it. I guess it isn’t two times the shear force, but rather just once. I don’t think you have to add the force and its counterforce. However, I’m not completely sure about it. Hanging a hammock is easy and straightforward, but getting a better hang, suitable for sleeping, can require more tweaking. Don’t give up! As to the pergola, I saw a similar one at Sam’s Club the other day. I really want one in my yard, but the prefab one at the store was about the same size you describe. It will be too small for most hammocks. Smaller hammocks that are about 9 ft long will probably work but the attachment point will be right at the limit. It won’t give you much flexibility to modify your hang. The other thing I want is the ability to use my tarp, so a pergola that has an inner distance of 12 ft is ideal. Also, after looking at the cost, I figured I could build one cheaper than buying a kit. I seem to have Metal studs in my wall, how would I go Of doing this? I already bought the eye Bolts. I’m not qualified to answer this one 🙂 I’ve seen some metal studs used in office buildings or steel prefab homes that don’t look like they would hold the horizontal sheering force. I’d have to ask a builder. Hello, I entered all the appropriate info into the Calculator (span between poles–8.6 ft; hammock length 13 ft; sit height, etc.) and I got as the measurement for suspension length a NEGATIVE 18.4 inches! What do I do? I can’t change the width of the span between poles. Thanks. The online calculator only allows you to select pre-determined (common) hang angles. Since you have such a short hang distance, you’ll have to hang the hammock up higher than normal. MY HAMMOCK stand is 10′ across I don’t know what length to order hammock for a 250# limit. The process doesn’t exactly work that way. If you have a hammock stand that has a fixed height and length than you’ve already limited yourself on what hammock you can buy that will fit in that space. I usually recommend folks get the hammock first. One of my favorite stands is the byer vario stand because it is adjustable and gives you more hanging options. Also, that stand, and a few others, is designed specifically for mayan-style hammocks with deeper sags. Most western style hammock stands are designed for net rope spreader bar hammocks so the height hang point is lower. This lower hang point means you can’t fit some hammocks well. Most parachute nylon hammocks have weight limits of 300 to 450 pounds. Steel hammock stands can hold much more than that. Depending on how high the stand is, you will be able to fit a lot of simple gathered end hammocks like the ENO DoubleNest. Look for hammocks that are less than 10 feet long for that stand. Just bought the app. Dumb question, but I don’t see it answered anywhere in the app or online. Is the clinometer used when hanging the hammock or when laying or sitting in the hammock? The most accurate measurement is if there is some tension to take up the slack, but not fully loaded. I bought the app for using on my iPhone 5S/iOS7.1.2. The app work great and I like it. However, it often quits when I change values — e.g. weight, ridge line, distance — in preference.and recalculate. Any fix will be appreciated. Thank you for the feedback. I’ll send this on to the developer. I’ve bought the app and have a suggestion for the user interface – can you make the number boxes active so we can tap on them and change the number? Thanks for the update. I’ll forward this on to the developer and see what they can find. My guess is that your internal accelerometer might need to be calibrated. If you have another app that includes a calibration tool (internal settings, perhaps? ), would be one way to check. Derek, thanks for a great program. I used to not sleep on the ground 3 times already. I have been camping as a ground dweller with the family. And as a family tent camping just works out. But when I go single I can go hammock. But I camp in CA and may have only 1 tree and the car. So thought why not use like a handy hammock or build the 1 side like the handy hammock and the tree. And use the car wheels as anchor or build just the 2×4 at 60 degrees, but trying to get how long the 2×4 needs to be? And I have a Hennessey hammock. And while the tool can help, do you happen to know what the numbers I should use for the Hennessey hammock? Trying to use the most reasonably short 2×4 for the car for travel, and the 30 hang angle and balance all the forces and still try to be reasonable height off the ground at the same time. If you use the Handy Hammock stand, you will keep them separated just about 6 inches past the ridge line of the Hennessy. If you want to buy only one strut or make your own, just borrow the dimensions of the stand. They aren’t very tall and you can make one out of a 2×4 pretty easily if you don’t care about packing it (car camping is great for this). Having huge issues with the calculator, bought this at the recommendation of a fellow hanger. I use a Nexus4, rooted, KitKat 4.4, and it will not run whatsoever. I would very much love to use this but am unable to do so..
Feel free to get back to me draggynsmate (at) MSN dot com. Thanks. I’ll forward this to the developer. Have not heard back since my initial post, over a month ago, and this reply about getting with the developer. Is there an issue running this on a Nexus 4, rooted, running KitKat 4.4 or am I going to be looking for another piece of software ? There is another one out there but I would prefer to support the developer hence the reason for the purchase, just like the purchase of the book. Its called Hammock Tools I believe..
Well, I’ll try to persuade the developer to get on task. Adam, I wish I had a better answer for you. My developer is very busy right now so changes are not yet available. Any further luck on this end ? Still have the rooted Nexus 4 running 4.4 and still experiencing the same errors.. Just checking to see if there has been any additional headway? Hammock Tools might not be available anymore–couldn’t find it on the app store. I believe it is 100 inches on the ridge line. Now after having had my head done in, I’m gonna do as the Mayans did all that time ago, risk happily falling to earth as Icarus did and simply string up the beast and head to the sun! Thankyou however to all of you for the analytical & entertaining ramblings and Derek for a fabulous idea…the hammock calculator. RE: Reader asking about hanging from steel studs…highly NOT recommended. RE: Vario stand and hammock length…I use a 13-ft Mayan hammock and it fits fine, although when it eventually stretches a bit, I can almost bottom out when sitting up in the middle and pushing down with my hands to exit the hammock. Question: Does it matter what hammock you are using when estimating hang height with the calculator? I have a 14-ft Brazilian hammock and it currently bottoms out on my Vario stand at 13-ft horizontal and 4’9″ arm height. According to the web calculator, I only need to go up 6-inches in height to have an 18-inch sit space. I would think I would need more than just 6-inches. The calculator will work with any size hammock. Just punch in the numbers. The problem is that a hammock stand has a fixed height and length. The other problem is that the stand flexes so the width shortens, which will also lower the sit height. Stretch in the hammock also creates an issue. The calculator doesn’t account for dynamic issues such as this. The calculator will work but if there are too many fixed variables it can’t miraculously make the stand behave differently. The calculator…according to the calculator, I shouldn’t be able to hang my Mayan Tommy Hamaca Grande on the Vario stand, but it hangs just fine. Thanks Van. I glossed over which stand you have, sorry. The Vario stand is unique. I also own the Vario an it has an adjustable base and arms so it can accommodate more hammock styles. Remember that the calculator is working from fixed numbers provided by the user. You can often squeeze or stretch a hammock into places the calculator say won’t work. The app’s static calculations cannot account for dynamic changes such as fabric stretch, flex in a stand, or variations from different suspension types. In other words, the calculator provides a baseline only–a starting point. “…provides a baseline only…” that may be okay for camping, but not when you want to install something on the walls indoors. I don’t want a bunch of holes in the walls trying to find the best place to span wall studs. Indoors is fine. Actually, this is where I use the calculator most because walls are static and you can easily measure and things stay put. What about when one anchor height is different from the other. Height needs to be a variable on the calculation. I have a pergola and the safer place to hang it is on the top of the vertical part. So how to count the appropriate height of the other hang side? I’m not sure if I’m understanding clearly, so let me restate. It is common for folks to hang their hammocks with the foot end higher than the head end for increased comfort in certain situations and hammocks. The calculator doesn’t account for this because it is a simple adjustment of lifting the foot end about 6 to 12 inches higher than what is indicated in the calculator. If you are talking about having a fixed hang point already and are using the calculator to return the other variables, than I totally agree — this is a common feature request that I have forwarded to the developer. High on my wish list is to have direct input of the variables and the ability to “lock” certain variables, such as hang point, when those variables are not adjustable. I’ll ping the developer again and see what the timeline will be for this. I’m still on stage one….I’m using a stud finder but can’t find the wood stud, only the steel studs. Any suggestions?? For steel you’ll just need to use different bolts or screws. Consult with a builder to determine what you have and what kind of lateral stress they can manage. I like the calculator, but this has been bugging me… How can it calculate sit height with a ridgeline without knowing the hammock length? It must use default values. I’ll look in to it. I’m 65 and just bought my first real hammock, a Warbonnet Ridgerunner. Q1: The calculator on my iPhone 5 returns “NaN ft” for the Hang Height even when I use the “reset” values. What’s needed to get it to show that value? Q2: How do I determine my ridgeline dimension? Is the ridgeline the length from triangle point to triangle point? If so is that laying on the ground or hung, which varies? Try reloading the app. Ill also ask the developer. The ridgeline is the length from the ends of the hammock along the line that connects them when the hammock is hung. Some hammocks have a rope/line that connects these two points that is fixed, usually around 83% of the total length of the hammock fabric. Thank for putting this cool tool up! I just noticed something weird is happening when you select the Metric radio button more than once – the numbers go crazy. How would i set this up if i was using a pipe stand from your site. Based on the calculation of 12feet total length and 100inch ridge line, 30 degree hangle, yes hangle, it gives me a high of 5 feet. The specs are i believe to 72 inches, which is 6 feet. Should i go with 5feet instead of 6feet high? Whatever all that means, i dont know. Ken, I’m checking with the developer. I just uninstalled it and re installed it and i keep getting the same code as above. By my calculations, i just paid twice and still cannot use it. I’m checking with the developer. In the meantime, contact the App Store to get a refund. I deleted the app again and contacted Goggle for a refund but would still like to have the app. Of course! I want you to enjoy the app too. The developer is looking at it. I wish I had more control over the code, but I don’t. Hi Ken, its pretty clear there are currently issues with the calculator. Derek is doin his best. You have been offered a refund. If its not satisfactory youd best join the hammock community..hammockforums.com and like the rest of us begin the wild wonderful journey into the many and varied ways of hanging. Hell! Neither the American Indians nor the Ancient Mayan Civilisation had calculators but slept suspended in peace! Please leave us in peace quit complaining and enjoy the discovery. Ultimately there are many ways to skin a cat..the calculator is but only one! Peace. I wasnt complaining, just trying to figure out a solution. I have been hammock camping for years and have just discovered that there is a correct way to do it. I didnt ask you for your smart aleck input and do not appreciate it. I was trying to resolve an issue with the app so why dont you go crawl back under a rock. Let’s keep it friendly guys. I didn’t take any offense from Ken’s question. Honestly, the android app has issues and I’m trying to get the developer to jump in. I’ll post an update when I hear back. Any new yet on what was going on with my download? It’s curious you used a discontinuous variable for the hang angle, with varying gaps between the selections. Why not just make it a straight entry like the other fields? Then if your angle is 35 degrees, the calculator still tells you something. The formula for rope tension is T = W / (2 sin A), where T is the tension, W is the weight of the person plus gear, and A is the angle. The formula for the horizontal shear is S = W / (2 tan A). Any decent calculator app is going to have trig functions, so people can make these calculations. Derek Thanks I have a android phone and the app works great. I am new to hammocks so been playing with the app a lot, plus I am 70 and hope a hammock will help us get back to camping this year. This is fantastic, I never knew figuring out the science of hanging a hammock while camping was so easy. We will be sharing this with our network for you. Hi…I’m planning on hanging a hammock chair without the spreader bar…so it will basically be like a short hammock. I can’t easily access the ceiling since there’s going to be a loft above it and I don’t trust the loft to carry the load (not the weight but the swing factor) so I’m planning on attaching it to studs at two points at an angle close to the corner of a wall. Can I use the same calculator? I’m not sure. It wasn’t designed for chairs but if it is now a mini hammock it might work. I have 8 feet between two trees. We had a hammock there for years and it recently broke. Trying to find one to fit. Any idea of the length of hammock i can buy? If the attachment point is directly on the tree, you could use a 10 ft hammock, but it doesn’t give you much latitude for suspension. I would go with maybe a 9.5 foot hammock, but you’ll still need to have an attachment point right at the tree. the app keeps resetting all the time. can’t get into the program. Hmm. Try restarting the phone. If nothing works, submit for a refund and send me any warning codes so I can tell the developer. Hi there, I used your calculator hang a double Brazilian (12 feet total length) hanging in a span of 11 feet, and it’s not hung quite right but is good enough for sleeping. I’m currently trying to hang a 13 foot (total length) Nicaraguan in that same span of 11 feet. I don’t use a ridgeline, so I was wondering if hammock length was just the length of the resting area, or if it’s the total hammock length. Total length including the clews. Phil, I must have missed your previous comment/question. I searched the spam folder too with no success. I’m sorry if your previous comment was lost, but I’m happy to respond (I try to respond to every question post to this site). You can also email me directly at theultimatehang@gmail.com. Thanks for this calculator. I am planning to build a pergola for the purpose of hanging 4 hammocks (+1 diagonally through the middle on occasion). If you were building an ideal hammock hanging pergola, suitable for an assortment of hammocks (I currently own an ENO doublenest), what would be your ideal distance between posts (on each side), and what would be the minimum distance that would still work? Thanks! Awesome! I’m planning to do something exactly like that. For your plans, it really depends on if you plan to hang your hammocks for lounging or camping. For lounging, you can get by with the struts at thee minimum hang distance for your hammock, around 10 to 11 ft. If you want to hang a tarp and camp, you’ll want the struts far enough apart to clear your tarp. I was planning to do mine around 12 feet. This is exactly what we are doing, with same hammock. So, on the picture on the app it looks like it accounts for suspension straps. We don’t want to use the suspension straps, just the clips on the hammock when we hang them in our pergola. So does that change the dimensions for anything? Or maybe I just need to go with what you said. 10-11′ distance between poles: will hang directly from hammock without use of straps. But if we do 12′ apart so a tarp can be used, then we will probably have to use the straps? is this correct?? Sorry, I’m a hammock newbie. Hi! Just bought a few 13′ hammocks for the kids to lounge on in the backyard. I have 4 pine trees in a line and was curious if there will be enough room to hang the hammocks in between or if I need to use additional posts for them. The space between the first two trees is 6′, the second space is 6’4″, and the third is 15’5″ (which I believe this one will be fine to use your calculator). I would appreciate any guidance! Thanks for your time! The minimum hang distance between anchor points is roughly 1 foot shorter than the hammock is long. For a 10-foot hammock, you would need a distance of about 9 feet. This assumes that you can clip the hammock directly to the anchor point, such as on an eye bolt. No suspension required. For a 13-foot hammock, you would want a distance of around 12 feet. If you try to hang a 13-foot hammock between a 6-foot span, the hammock will have to be hung very high and it would have a very deep sag. That sag may not allow you to lay in the hammock. If I’m hanging outdoors, even in my yard, I like to have room for a tarp so I can sleep and be protected from the elements. To make that happen, you’d want a distance of at least 12 feet to accommodate the tarp. I hope this helps! Have a byer vario hammock stand and had a question about trying to hang 2 different hammocks (of different sizes) from the same basic setup—both Brazilian. My larger Hammock is a about 156″ in length and the shorter one is about 9.5-10ft in length (both cotton). The larger one fits fine at full height of the vertical bars and about 12ft apart. I had the shorter one initially set up with the vertical bars at the lowest point and the stand closed up as tight as it goes, connected using some nylon rope. It worked but could never really get very horizontal in it. If I made the sag more, I would hit the cross bar. Anyway thought maybe I could make the shorter one work with the setup for the larger one. I put in the length of the hammock and sit height, and then made my ropes to the the suspension height. While the hang/sag looked nice, when I lay down in it, I bottom out. Any suggestions as to how to maybe make the short Hammock work in the Vario so I could swap out the 2 different Hammocks without re-sizing the vario? Or even making the short hammock work with things closed up. Also, one other question. My larger hammock (156in) is cotton and pretty new. I assume it will stretch over time. Since the vario bars only seem to only extend to about 56-57in, and I’m at max height now, is my only solution to maintain the proper sag if it stretches more (and I start to hit the cross bar) to widen the distance or would doing something to shorten the end ropes be a better solution. With my vario stand I found it better to adjust the stand. It is a bit of work, but not too bad. The biggest challenge with stands is the height. If the stand were taller you could use it for both hammocks without changing the stand but simply changing the hang point. The cotton will stretch a little over time but it shouldn’t be so bad as to bottom out. Wow….took a while to get through all the comments. Thanks, Derek, for this site. I have had hammocks for my yard for years and used them on many Boy Scout camping trips….SO much better than sleeping on rocks. Now that I have retired and am at the older years, I have been considering how to put a hammock on my back patio. I have a beautiful view to the lake to the north and the breezes all come from the south. So, my only option is between two brick columns, which are 11′-6″ apart. I love the look of the Mayan Rada and am considering that with tree straps (which I am pretty confident will work on the brick columns (they are square, so will allow for easy wrapping). I was using the calculator and want to make sure I understand the physics. The hammock I am considering is one of the twin size which is 12.79′ long with a body length of 6.3′. I think with a sit height of about 20″ or so, this should work between the columns, but want an expert opinion BEFORE I order. Am I correct in my thinking? Again, thanks for taking time to answer guys like me who have spent most of our lives doing other stuff (I design and build golf courses), so this is a little different math for me. No worries! The math is a bit different for me as well (I had help making it work). If you punch in the numbers into the calculator, it should give you the hang point. For those Mayan-style hammocks, you want to measure the complete length, from clew to clew, which would be the nearly 13 foot length you mention. Your question is whether it will fit in your 11+ foot space. I believe it will, since you will want to hang with a bigger angle, maybe 40°+ or so. The hang point will be higher up the posts. Thanks….I would just hate to order and be anticipating enjoying time in it only to find I was not smart enough to figure out it would not fit in the first place. Appreciate your input. The hammock I really want is the large, but it is 13.4′ and I am just leery of it fitting in that space without the hang angle looking stupid. What would be the formula / calculation to determine the tension on a fixed ridgeline? I would guess that would change the dynamics of the whole calculator if a fixed ridgeline is installed on the hammock. Now we are dealing with the angles from the suspension height affecting the load that is occurring from the hammock now a fixed angle with the ridgeline. I’ve been trying to determine what is the lightest weight cordage that would be appropriate for the ridgeline. Could you tell me what the ridgeline length should be for an ENO Doublenest? Calculate 83% of the length of the hammock as a starting point. Also forgot to ask, do you measure overall length and ridgeline length from the far end of each carabiner where it contacts your suspension lines? Length of the hammock only since the ridge line is typically connected from these two points. I have a stupid question on Hammock length. I have a very cheap Ikea like hammock that I am hanging indoors. They have rope strings that have the loop. The package says 6ft hammock but when measured from loop to loop it is 8′. Which measurement do I input into the tool? Hi. I was bored so I worked out the equations with the food end higher than the head end. If you don’t want to bother, a decent rule of thumb is to use the existing calculator, then raise the foot end by two third of however much you want the foot end to be higher, and lower the head end by one third of that distance (ex: if you want the foot end 30cm higher, raise the foot end 20cm and lower the head end 10cm). Dear Derek, your calculator is wrong: it’s missing a factor 2. I suppose you’re using the parabola equation (it would be more accurate with the catenary equation, but it doesn’t change by much). So the equation is y=L (x/L)^2. Now you want an angle alpha, this means that the derivative must be equal to tan(alpha), so x/L=tan(alpha)/2. Now you can calculate L by imposing that y is the height between the lowest and the highest point and you get L=y/(tan(alpha)/2)^2. So x=2 y /tan(alpha). But remember, this is HALF the distance between the trees, so you have to multiply by two. You’re missing this last part. I’m using the calculator in metric units, if there’s any difference. If you don’t believe me, just use your calculator, hang a rope between two trees and measure with a protractor (I’ve tried), you’ll see the distance you use in your calculator is off by a factor of two if you want the angle alpha and the difference in height equal to y. By the way, you should do the calculations with the catenary equation y=L cosh(x/L), it would give you more accurate results. I can’t make this thing work. The page works fine, but the numbers are all wrong. I’ll explain. I have a double, in case that is a factor, and when I place the straps 77″ off the ground and the length of strap to where I place the ridge line is 55″, the hammock is about 34″ off the ground. I found that 70″ high got me closer to sitting height. I rarely take a stool backpacking. I tried this with varying distances and the calculated heights and lengths are just all wrong, giving me similar results. What part do I not understand? Show me the numbers. What is the length of your hammock? What angle are you hanging? Are you using a ridgeline? I went down to my subterranean laboratory and came up with some numbers. For that distance and hammock length the web calculator says the strap length should be 67″. My straps have loops in 4″ increments, so I got as close to 67 as I could. If I use a hammock length of 138 (112 + 13 + 13), strap length (strap only) of 55, the angle is 45. Don’t get me wrong. I doubt you would have gone to the trouble of making this site or paying a developer to create apps if it just didn’t work, but I can do better by eye than what this thing gives me. For the right angle, the strap lengths are way off. I can adjust the sit height by lowering the hanging point. If you have any insights, let me know. Was there something else you wanted to know? No this is great. I just need some time. Holidays are pulling me away. Were you able to come up with anything or am I using your calculator incorrectly? Honestly, I haven’t had a chance to experiment. Please email me directly so we can coordinate a good time. If I have a 11′ wall and I’m looking to hang a 7′ hammock for two people. Do you think this is possible? Two people in one hammock? Is the hammock only 7 feet long? That’s really short. It looks like you have a traditional Brazilian or Mayan hammock. Those hammocks, if I understand you correctly, have a ‘bed’ that is attached to strings. Those strings are called the nettles that all combine to the clew. This is all part of the overall hammock length. Some of those hammocks can be as long as 14 feet or more. This is the length you use in the calculation. The suspension is what attaches to the hammock and spans and distance to the anchor point. Some hammocks don’t need suspension if they are long enough to reach the anchor point. For some of my hammocks indoors, they just clip on to my bolts. Other hammocks need a short suspension to reach. I hope this makes sense. Do you hang the eye-bolt higher on the foot end? or can you affect the hang with shorter suspension on one side? While camping, I usually will do a bit of both but was not sure how I would compensate indoors. It depends on your hang distance. You can ‘cheat’ by hanging your hammock off center if the distance is long enough. I just shift my body by putting my torso more center and my feet higher in the hammock. – With the above details it suggests – Anchor points at 200cm and a 100cm suspension length at each end. (200cm in total). I assume the above only applies if the suspension length required is even at each ends, if not, the different heign anchor points are required…Correct? How would you suggest I work that different suspension lengths with your calculator. I have tried to adjust the actual distance between anchors (3.2) until I have the desired suspension length at one end 50cm. It gives me achor point at 172cm high. Does this makes sense? Does the maths work or….? The calculator helps with a starting point, but you can modify from there for sure. Shortening one suspension length has a similar effect to raising one end higher than the other. I’m thinking of creating an indoor hammock stand for a very small space, and the main detail I’m having some trouble deciding is at what height the hang points should be. The plan is to hang my ENO Doublenest hammock across a bedroom corner (over my bed, which is 18″ tall including bedding). Distance between the walls (next to the 2 window frames) is approximately 88-90″, so subtracting a couple inches for the frame, I estimate the distance between anchors will be about 7′. A 20-28″ ground clearance seems suitable (pretty sure space constraints will force entering the hammock from the bed…) and I think anything between 30-45 degrees would be ok for the hang angle. According to the calculator, for the 30 degree angle with sit heights of 20″, 24″, & 28″, the heights for hang points are 44.2″, 48.2″, and 52.2″, respectively, with a -7.5″ suspension. For a 45 degree angle, the respective hang point heights are 62″, 66″, & 70″, with a 3.4″ suspension. It would be nice if I could attach the hammock directly to my anchor points, but I need to eventually get/assemble a suspension system for camping anyway, so that’s not really a big deal. I do wonder how I could construct the stand to allow for “negative” suspension lengths (have seen stands online where a portion of the hammock can fold over a top bar & then anchor at a lower point, but that seems challenging to design). Materials for the stand have yet to be decided, but I am leaning towards wood because my roommate has a good source of free pallets & scrap lumber. My other viable option would be PVC pipes, which would cost more & be less attractive with somewhat better portability. For what it’s worth, I’m 5’2″, 113 lbs, am accustomed to sleeping more or less in the fetal position, & tend to like being “cocooned”. Any advice on deciding how high to make the hang points (or the highest ones – perhaps it could be built with a few different options available)? I would use a set of the ENO wall anchors and then use a short cord loop where you could connect your hammock. If you put the anchor point at the highest point you reference, you could then hang your hammock at a higher angle (45) using the loop extender, or at a lower angle (30) by clipping directly to the anchor bolts. This is what I do in a few of my rooms to accommodate a few different hammocks and give me some flexibility. It means the sit height isn’t ideal 100% of the time, but it is still usable. is it possible to use the app offline? Never mind. I think I figured it out. I have to measure the angle with me in it, which gets easier when I have a second pair of hands. The numbers check out. Yes, the calculator looks at straight lines. You don’t have to have a lot of weight in the hammock; just enough to pull the fabric straight. I use the calculator and have your book also. We want to try some short overnight camping trips this year but do not like sleeping on the ground anymore. I hung the hammock in the house and it worked out great using the calculator and a tape. I read about the foot being about higher than the head so I did this using the suspension (letting out the head 6″ and tighten the foot 6″). My wife said this was better for her she has a bad back. Is it ok to do it this way or should I put in a new hook higher for the foot of the hammock? By the way the hooks I used were rated at 465 lb apiece going into triple 2×6 studs framing a 12’6″ arch at each side. We are both in our 70s and did not want to hit the floor. Sounds like you’ve got it! Yes, taking the hammock off center has a similar effect of hanging one end higher. Thanks . The calculator make it a lot easier for me plus learning a lot from your book, I have also made some of your DIY gear from the plans on the web site. 1 about the anchors being under lateral (torsional) stress and either pulling out or breaking. 2 about the stress on the Victorian walls – presumably the mountings will fail before the walls do. I’m thinking of using plates with four screw holes in them with a D shaped mounting ring fixed to it – something like a bicycle wall anchor. That sounds like a good idea. Using the right type of anchor bolts for the material is key. I’d post specific questions to a building contractor. I just tried to use it on my Nexus 6P (Android) and it says my resolution isn’t supported and won’t work. Any updates in future? Yes. I am working an a major update to the app. Love the app. The Google Play link needs to be updated. It directs to the old listing and gives a “not available in your country” message. Thanks. We are actively working on the app. Is it supposed to work on my laptop? or am not doing something correctly? The web version should work on any internet browser. Try tabbing to each input block or click into each one to see it change the result. Wow, Derek is really on the job here! Nice work! For my hammock, I over-engineered, which is to say, I went big without doing any calculations. Bought a Pawley’s Island hammock. Went to Home Cheapo, bought two 12′ lengths of 1-1/2″ diameter pipe and one 12′ length of 2″ diameter galvanized pipe, and cut it in half. I hammered each 6′ section of the 2″ diameter pipe into the ground at 45 degree angles by using a 2-1/2″ diameter pipe with an endcap over the 2″ diameter pipe. I laid out the hammock on the ground to see where I needed the two pipes to be placed in order to hold the hammock at the right height and angle, knowing I could fine-tune the distance with a length of chain later. I hammered the 2″ pipe into the ground with the 2-1/2″ diameter pipe and the endcap took the abuse of the sledgehammer, and left the open end of the 2″ pipe nice and round and clean- no deformations. I would hammer the pipe in a few inches, then put the 1-1/2″ pipe in to get the dirt from inside the pipe out. Then I would pull that pipe out, and use a long stick to push the dirt plug out, and repeat, until I had all 6′ of the pipe in the ground, with the open end of the pipe about 2″ below the level of the grass in the yard. Now, when I want to set up the hammock, I bring out the 1-1/2″ diameter pipes and insert them into the 2″ diameter pipe in the ground and wallah- instead hammock setup. (I have hooks for the hammock on the top of the 1-1/2″ diameter pipe.) When I take it down, there is nothing in the way, and only two pipes and the hammock to store. 15 years, so far, so good. is the hang angle measured while it’s loaded or before you get in the hammock? You want to get a straight line measurement, not necessarily loaded. A relaxed, empty hammock will hang in a catenary curve that won’t be accurate. You can pull down the center of the hammock or put something light in the bottom to tension the hammock. A weighted hammock will stretch everything and also distort the hang angle. I can enter info into the field boxes, but there is no calculate tab ??? When you type the tab key it should auto update. worked like a dream, i now have a hammock in my living room. Thankyou so much!! was shocked at how accurate this was and how well the results were. Derek, I love this calculator and use it quite a bit. Thanks for your efforts! Often, I find myself trying to hang a hammock off-center – closer to one tree than the other. So basically, I find the optimal hang for a centered hammock, and then end up adjusting the hang point and suspension length on each side to maintain the angle and move the hammock closer to one of the trees. If you are looking for new features, I’d love to have that included! Thanks again for this handy app. I just verified what I suspected with my indoor setup. I hang from rafters in my basement that are about 11.75′ apart and 91″ high. I have a Roo (10′) so unless I want to be way up in the air (50″), I am at a much higher than 30 degree angle. I plugged in the Wallaby size (8’4″) and was surprised that nothing changed except the suspension length. I was considering a Wallaby, or something smaller, as a second hammock, and also as a possible hammock to hang from the backyard stand we have with the typical rope hammock with the spreader bars as my Roo is way too big. This will tell me what I could expect from that. if I understand it right, the only thing that would change is that I might have a non-negative suspension length with a shorter hammock. having trouble achieving an 18in seat height with the calculator my hammock is 125″ inside the whippings and has a 108″ ridgeline I hang it from a hammock stand that has 11 ft between the anchors and the anchors are 65″ above the ground according to the calculator I should hang at aprox 56 inches off the ground with 13.7 inch suspension lines for an 11ft span to achieve the 18″ seat height however the actual seat height even hanging at 65 inches is only 10 inches I used 30 degrees for the value in the calculator not sure why things are not seeming to line up? Hi, I have a 9ft hammock, and would like to buy a hammock stand for my bedroom. What is the shortest stand I could possibly get that would work comfortably with my hammock? Is get the Vario stand. It is adjustable so you can fit it into smaller spaces. Sorry the numbers are different between the app and the online calc with respect to susp length and hang point. Interesting. Let me do some checking on that. Any thoughts on this. Not clear why when I enter the length of my ENO hammock it shows up in the ridgline length ALSO. Think when I did this the suspension length came out wrong. The ENO is a fairly short hammock. I believe the default ridgeline length in the calculator is the same length. It isn’t calculated. I need to confirm that. A common value is 83% of the hammock length. The only difference is that the force on the studs would be spread out, correct? The height & distances would still be the same? Correct. This is a great option for disbursing the weight across multiple studs. Which is right and can you help? Yup. Let me look into that. I went to downplay the hammock calculator from the Google Play Store and just about every review said it wasn’t working on their phone (I have a Nexus 5x, which a few said it wasn’t working on), giving it a 1.8 rating. What’s going on? The last developer update was over a year ago on August 30, 2015. Has this app been abandoned or is it just un-updateable? Hope that there is hope for this app, as I would really like to make use of it. Thanks for any clarification you can provide. Bruce, thanks for asking. The app is still in development and I’ve been working with the developer to create a new version to fix the Android problems. The issue has been supporting all the different device resolutions. The developer has assured me that the new version fixes all this and we have been trying to figure out how to get it updated as soon as possible. So for a given load at the bottom aka hammock, the straps from the tree to the hammock ends, do they take the same load, or is the load split between them? Reason I ask, seen straps rated at only 200 lbs, so given the hammock is rated at $400 lbs, they seem to think it’s enough. Oddly, I see reviews of the 200 lbs failing, due to, reviewer guessing, manufacturing defects? It’s the same load on both sides, per the calculation. Hammock straps are often given a safety factor of 4:1 or 5:1, so the weight you see is the working load limit. Be sure to check with the manufacturer first on how they make that claim. Some just list the breaking strength (e.g., 1,000 lbs) but the safe load is more like 250 lbs. This allows for the dynamic reality of hanging in a hammock. How should I measure? Should I chose “Hammock length” instead and measure from loop to loop (the loops at each end)? Yes, use the hammock length and measure the full length (loop to loop, or clew to clew). The iOS version of the Hammock Hang Calculator does NOT have a clinometer. Knowing that, I would not have paid for it. Please update this web page. Or update the app, either way. But as it stands right now it is misleading to the point of fraud. But hey, I loved the book! Dan, you’re right, I forgot to take that notice off my site. I’ve removed that information from my site. It was an oversight. If you would like a refund, please submit to the iOS store. Please note that I am working to bring the clinometer back (it was in the first version, but was too costly to update in the latest update). Anyway, I’m sorry about the mixup. I can’t get the calculator to work. The Tab button doesn’t activate the calculation. Thank you. What browser are you using? I highly recommend getting my book. is shear force the lateral force on a single tree, or for both trees? For example, if I wanted to calculate the compression force on a compression pole in a turtledog stand, is it 2*(shear force), or is compression force mathed out completely different?